You can download the NecksGen User's Manual here. The body forming pads place very little pressure on your collar bone, making the unit extremely comfortable and unlikely to create injury to your collarbone under impact. Due to the placement and angle of the lower tether mount, the Impact NecksGen unit offers unsurpassed angular impact protection. The design and choice of materials in the Impact NecksGen unit allow the unit to flex while driving which creates a condition where driver fatigue is minimized. The combination of seat belt wings and belt guides keep the unit in a vertical position at all times for optimum protection. The NecksGen unit offers unsurpassed impact test results. The low rear section, which is adjustable from 10-40 degrees, creates minimal interference with the seat and helmet in the driving position. The single adjustable helmet tether creates full range of head motion while driving. The Impact NecksGen Large unit accomodates 3" seat belts. Only $599 and comes complete with Quick Release Helmet Hardware - it has everything you need to go racing! 1. Quick Release Helmet Hardware:This is a unique two finger quick eject helmet attachment system. 2. Emergency Pull:Optional pull tag for quick disconnect. 3. Wings:Standard Large adult unit can accept 2” or 3” seat belts. Small unit accepts 2" belts only. 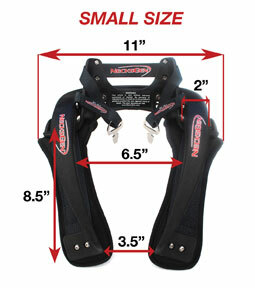 The wings aid in keeping your harness in place under impact. Even in multiple impact situations where the belts could loosen. 4. Flexible Bar:This allows for upper body movement and comfort while driving. Also allows user to flex the unit over larger necks. 5. Belt Guides:The guides keep the unit centered on the driver at all times, not allowing the unit to slip from under the belts. 6. Body Forming Pads:The body forming Kevlar belts with Nomexå¨ pads fit under the seat belt, therefore taking any pressure off the collar bone and making the unit very comfortable. 7. Adjustable Rear:The unit is adjustable to fit most seat angles from 10å¡-40å¡. This also allows the driver to adjust the back of the unit for comfort or interference with the helmet or the seat. 8. Low Rear:The low profile design allows easy access from confined areas with little interference on roll bars in dragsters and landspeed cars. 9. Tension Neutralizing Tether:Using a single self-neutralizing tether, the loads under impact are distributed through four different load paths. This unique system offers an equal distribution of forces under impact. This system also offers a full range of head motion and side and angular impact protection. Has the Impact NecksGen passed any safety standard testing? Yes - the NecksGen has passed the mandated SFI 38.1 testing. Is the Impact NecksGen an approved device for my sanctioning body? 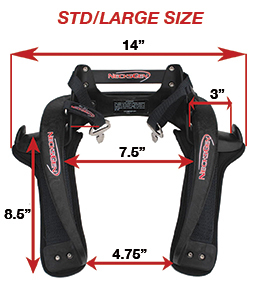 Most racing organizations in the USA, that have recently mandated neck restraints, require an SFI approved device. NecksGen is an SFI approved device. How does the Impact NecksGen stand up to other restraints in the market in testing? Amazing! 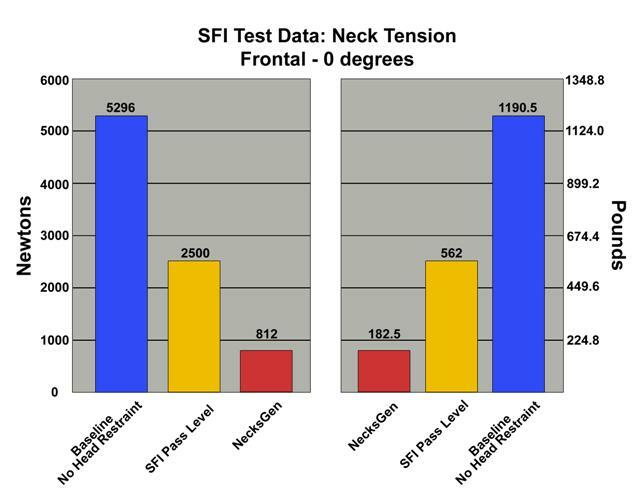 The Impact NecksGen has passed the SFI test with results that exceed all of our expectations! Does the Impact NecksGen offer any side protection? Yes, the Impact NecksGen incorporates lateral tethers, that offer alternative load paths in side-on impact for superior protection. Is the Impact NecksGen flame resistant? 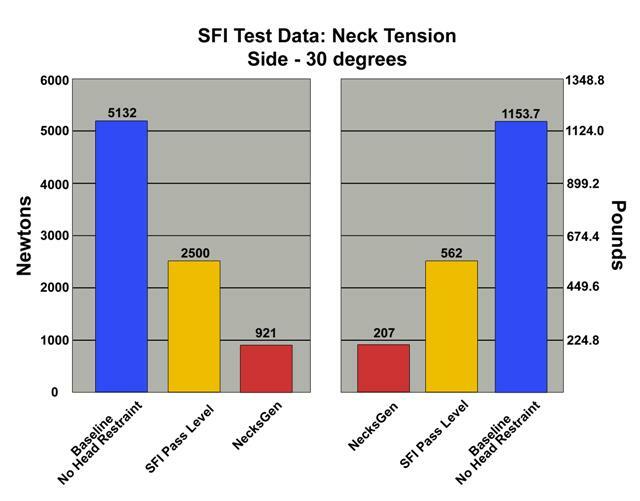 Yes, the NecksGen has been tested to the SFI flame testing standard. Does the Impact NecksGen unit come in different sizes? Yes. Impact NecksGen now comes in 3 sizes. The Large unit fits most adults, typically a driver 100 lbs or more. The Medium unit is for smaller torso drivers 1" narrower but still accepts 2" or 3" seat belts. The Small unit, also fits small torso drivers, typically women or anyone less than 100 lbs. The Small size accommodates only a 2" seat belt. Where is the Impact NecksGen made? Made in the USA! Specifically in San Diego, California. What is the Impact NecksGen made from? The Impact NecksGen is made from a DuPont carbon fiber composite. How heavy is the Impact NecksGen? 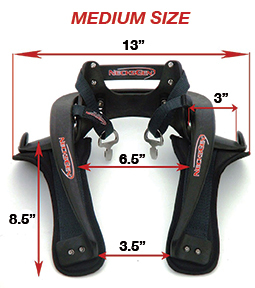 The Impact NecksGen is very lightweight, at 1.9 lbs for the Large unit and 1.8 lbs for the Small unit (with all tethers and hardware attachments). Do I need special tools to install the Impact NecksGen? No, the NecksGen uses standard tools. We do supply a tool kit. The Impact NecksGen unit comes with a free carrying bag to protect your unit. Will I be able to move my head from side to side? Yes, the Impact NecksGen has self aligning tethers that offer range of motion from left to right. Will the unit place pressure on my clavicle (collar bone)? No, the Impact NecksGen has body forming belts and pads which go under the seat belt at the collar bone. There is no hard surface on your collar bone. Will I need to buy shoulder pads? No, the Impact NecksGen comes with shoulder pads. Will the Impact NecksGen restrict my body movement? No, the NecksGen is a flexible unit, which allows upper body and arm movement. What can I do if I feel the Impact NecksGen unit hitting my helmet? If it feels too close to your helmet, move the angle back a notch (move bolt up one slot). What can I do if I feel the Impact NecksGen unit hitting my seat? If it feels too close to your seat, move the angle forward a notch (move bolt down one slot). Will the Impact NecksGen unit interfere with my roll bar? No, the low rear section of the NecksGen allows easy access in tight areas with low roll bars, such as Dragsters and land speed cars. Do you do a 5 year recertification? Yes, SFI 38.1 now requires a recertification after 5 years. The recertification will cost $15 plus parts and shipping. After any accident, you should inspect the unit for any sign of damage. After a crash, the effectiveness of the Impact NecksGen unit can be greatly diminished. If you have any doubt about the integrity of your Impact NecksGen, replace it or at the very least, send it back to us for inspection and recertification. Do not take any chances with your safety by racing with a compromised Impact NecksGen unit. Is the Impact NecksGen waterproof? Yes, you spot clean the Impact NecksGen with water and a rag. Do not use detergents on the tethers as the compounds in soaps and detergents can compromise the integrity of the tether material. Can I paint my Impact NecksGen? Yes, the Impact NecksGen unit is made from a carbon fiber composite which is resistant to paints and solvents and will not compromise the unit. Always ensure the tethers are kept free of detergents and solvents as these compounds can compromise the integrity of the tether material. Can I take my Impact Necksgen unit apart? Yes, the Impact NecksGen unit is a very simple assembly. Please be sure to follow all instructions in manual and installation guide on reassembly. Does the Impact NecksGen come with a Quick Release helmet hardware? Yes, included in the price for $599 you get Quick Release helmet hardware. Do I need to buy additional helmet hardware or other accessories? No, the Impact NecksGen unit comes with all the helmet hardware needed. You can buy additional sets of Quick Release helmet hardware if you have multiple helmets. Will I need to drill my helmet? If you have a new SAH2010 helmet or a pre-drilled helmet, it is OK to use these. What do I do if my helmet has been drilled? The Impact NecksGen will work using those holes! Simply install the Quick Release helmet hardware using the backing plate (washer nut). You will have to unscrew the backing plate from the helmet hardware (backing plate is screwed to the QR helmet hardware when you buy it). The backing plate goes in the inside of your helmet - between the foam and the inside of the helmet..
What if my helmet has never been drilled? You easily drill your helmet by viewing the helmet drilling instructions. Do I need to adjust my tethers? No, the NecksGen tethers come a fixed length which has been predetermined in testing to allow proper protection. 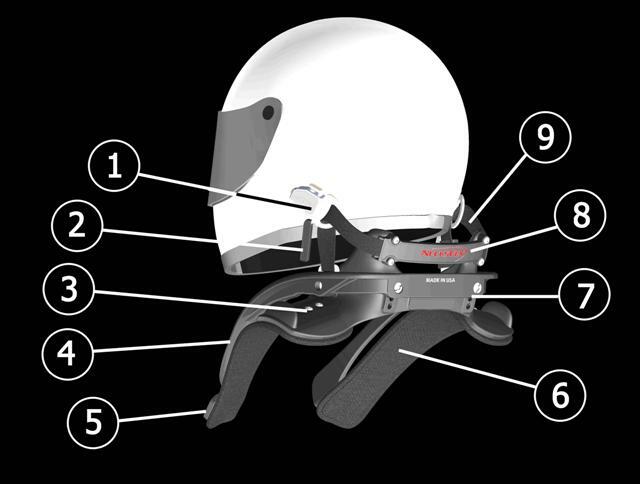 However, all helmets are different in design and manufacture, therefore SAH2010 pre-drilled holes may be in different positions. Drivers also have different neck lengths. For these reasons, check fitment according to the manual. When strapped in the car with the head in the neutral driving position you should have no more then 3” of pinched slack. Please see manual. Some drivers may be able to move their head forward and still not feel the tension of the tethers, this is OK. Also do not worry if the base of the helmet touches the bar. In the event of an accident, the unit is held back by the seat belts, whereas the body, neck & head will move forward and away from the device. It is at this point, that the tethers will tension up to minimize neck tension. Can I use 2” seat belts with my NG? Yes, 2 inch belts work with all Impact NecksGen units. Can I use 3” seat belts with my NG? 3 inch belts work with the Impact NecksGen Large and Medium. However, the Impact NecksGen Small can only accept 2" belts. What should the gap between my upper belts behind the seat be? The gap can be as close as 3" and as wide as 8". What angle should the seat belts be from the mounting point to my shoulders? We recommend anywhere from zero to 5 degrees below horizontal. How do I know what angle to set my Impact NecksGen to? Using the setup instructions you will be able to determine your seat angle. See manual. Can my seat belts come off my shoulders while driving or during and accident? No, the Impact NecksGen has upper belt guides that will keep a secure belt on at all times. Can the unit rotate while driving or during an accident? No, the Impact NecksGen has lower belt guides that will keep the unit centered at all times. Does NG work with my seat? Yes, the Impact NecksGen unit will work with most race seats. The unit will adjust from 10 - 40 degrees.